Please scroll down the page for an English translation. Most Chinese celebrating national holidays in early October were not aware that across the globe in Johannesburg, South Africa, decisions passed at an international convention meeting will have long lasting impact on many industries in China, including the Hongmu furniture industry. It is only recently that the term Hongmu (red wood in Chinese, largely referring to tropical rosewood) has caught the world’s attention: the Environmental Investigation Agency is the first international NGO to investigate and expose the impact of the Hongmu industry on global tropical forests. Since EIA released a major report on China’s illegal timber trade around the world in 2012, it has released a series of reports detailing the consequences of logging and trade of Hongmu on the societies and forests in Asia, Africa and Latin Africa. The little known stories of the Hongmu trade started to be told in China too. Furthermore, during the 17th Conference of the Parties (CoP17) of the United Nations’ Convention on International Trade in Endangered Species of Flora and Fauna (CITES, aka the Washington Convention) that took place in South Africa last month, countries adopted various changes related to Hongmu species, making illegal logging and illegal timber trade again a focus on the world’s stage. The most significant result for forests was undoubtedly the listing of the Dalbergia genus onto the Appendix II of CITES. This will mean that, with a few exceptions, nearly all the international trade of Dalbergia species will only be allowed for trade with permits. Fourteen species of China’s current National Hongmu Standard, almost half of the official Hongmu species, will be restricted for trade from next year. Dalbergia species to be listed onto Appendix II include over 250 tropical species. The adoption of this proposal, considered not long ago to be a ‘mission impossible’, was of consensus. Representatives from Latin America and Africa spoke in favour of the proposal, citing instances of illegal logging. They said that listing all Dalbergia at once will alleviate pressure on enforcement as criminals often mis-declare and target replacement species – for instance, Burmese rosewoods are widely smuggled as replacement species for the lookalike but more valuable Dalbergia cochinchinesis (Siamese rosewood). Shortly after the above proposal was adopted, another species Pterocarpus erinaceus (Kosso, also known as African Huahuali) was also up-listed onto Appendix II. The co-proponents, 11 West African countries and the European Union pointed out that although logging and export of Kosso logs have been banned across almost all its range in West Africa, China’s imports of Kosso logs in 2015 have increased by 2,000 times compared to 2009. The range states therefore had to turn to the international convention to save the species from extinction. 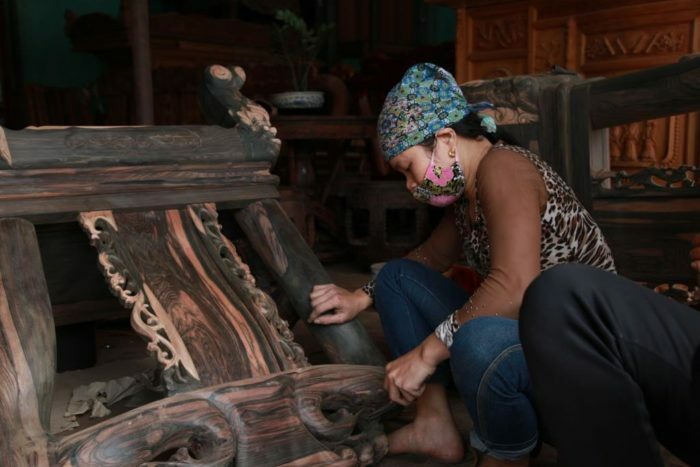 At the same time, Thailand’s proposal to close a loophole in Siamese rosewood’s listing was adopted unanimously. From next year, all international trade of Siamese rosewood, with very few exception such as seeds, can only be sanctioned with relevant CITES permits. EIA’s report described how Siamese rosewood was being wiped out by illegal trade in the Mekong region. According to recent years’ Customs import and export data, Laos and Madagascar are the two main suppliers of Hongmu raw materials. During CoP17, these two countries were punished for weak forest governance and inability to control illegal timber trade: all parties are requested to suspend importing Siamese rosewood from Laos; the international trade embargo on Madagascar’s Dalbergia and Diospyros species is also maintained. These measures will be in place until Laos’ and Madagascar’s compliance have been approved. It is worth noting that listing Hongmu species onto an international convention was almost the last resort for the international community: for example, 13 of China’s top 15 suppliers of Hongmu logs in 2015 have banned the export of logs. Because China does not have reciprocal legislation, once timber was smuggled out of a range state it can almost certainly enter China legally. But under the CITES’ framework, China must comply with the rules as a signatory. Hongmu species listed on the Appendix II can still be allowed for international trade with permits from export, transit and import countries. One of the pre-conditions for allowing such trade is that it will not be detrimental to the survival of the species. The above measures are intended to protect global Hongmu resources, but they should also be beneficial to the long-term development of the Hongmu industry. Historically, Hongmu furniture and ornaments are luxuries exclusive to the royals in China. In recent decades, a Hongmu industry has emerged and rapidly expanded: traditional Ming and Qing dynasty furniture is being reproduced on an industrial scale, Hongmu raw materials are becoming sought-after investments, Hongmu traders are flocking overseas and Hongmu products are competing to create yet another price record. While a bubble is clearly being inflated, few have reflected on the rapid development of the Hongmu industry – most ordinary Hongmu consumers have no knowledge of the illegal logging and trade in Hongmu globally. However, the industry insiders know the Hongmu industry cannot be sustained at the speed of recent years – not only many range states haves placed restrictions on logging and exports, the production and retail of Hongmu within China are evidently excessive of what’s actually needed. In recent years, the changing economic situation, coupled with a nationwide anti-corruption campaign, is forcing the Hongmu industry to face up to the difficult question like many other industries – is there a way forward for it to become a more sustainable and environment-friendly industry? Other more developed timber markets such as the US, the EU and Australia have gone through similar reflections. One important turning point is that consumers, industries and environmental groups have worked together to push for a legislation to prohibit illegal timber from entering these markets. I believe China will one day adopt similar measures to protect its own responsible timber companies from the illegal trade. But, before that day arrives, the global conservation of Hongmu resources will still have to depend on the restrictions and management of the CITES convention.